John Hillman is editor of PC Site and head of publishing and projects at Net Media Planet. With video in the ascendancy many independent online publishers and bloggers are beginning to feel that offering video content is a necessity rather than a nice optional extra. Yet creating editing and hosting a video can be an expensive and time consuming business that isn’t always easy to get right. However, building a YouTube channel to sit alongside your indie website, whether it’s a blog, online magazine or hyperlocal, is much easier than many people would think. You can build the channel out to look exactly like your existing site, and with some good content and clever use of title tags you could find yourself attracting lots of new readers that may never have found you otherwise. As an independent online publisher we’ve found that YouTube has a lot to offer, providing us with a platform on which to publish unique video content, increasing our readership levels and helping us build our reputation as a quality online technology site. Fortunately online video is valued more for its content than its production value, so while big news organisations may spend thousands on AV equipment, any indie publisher can get going with tools as basic as a Flip video camera and an open source video editing programme. This amounts to a total cost of around £150. At PC-Site we use Flip video cameras all the time. They are cheap, small and fully optimized for the internet. This lets you get on with making basic videos without having to worry about such unfathomable tech conundrums as codecs fighting each other on the timeline. When it comes to editing software there are lots of open source options out there, but Camtasia Studio works exceptionally well as both a movie editor and for creating screencasts. It costs about £220, which is excellent value for money. It also lets you automatically upload directly to your YouTube channel once you’ve finished the production process, saving you time. Alternatively we use TubeMogul to upload our videos as it enables us to do it across multiple sites, such as YouTube, HowCast and Vimeo simultaneously. This is a very important part of the process. It takes surprisingly little to give both your videos and your YouTube channel a quick makeover so that they reflect your blog or website. Using Adobe Fireworks, for example, you can quickly mock up a little logo, if you have one, which will sit nicely in the corner of your screen during playback. 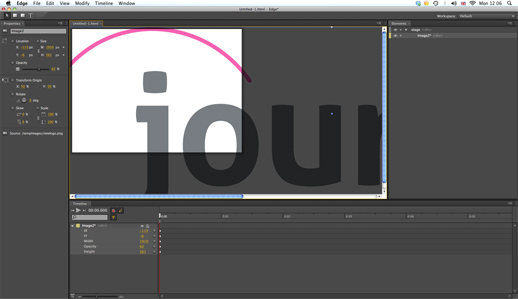 Those of you with Adobe Illustrator skills can even create an ident to give your videos that real ‘TV Channel’ look. All of these things require a bit of extra effort but they really make a big difference to the finished product. Your YouTube channel itself can also be branded by uploading a suitable background image that fits with your blog or website, and by going through the YouTube registration process you will be able to choose how the URL ends, also giving you that extra brand uniformity. Once you’ve customised your videos and YouTube channel you can use the ‘sharing’ button to automatically syndicate your videos through your various online social networks, and you can embed your videos on your blog or website. You can also link your YouTube channel directly with your blog using the ‘blog setup’ button, this way your videos will post straight to your website from YouTube. Getting it all up and running does take a small investment from you in terms of time, problem solving and creative thought, but the benefits that come from it are well worth the effort. One of our videos got nearly 30,000 views in a couple of months, all from just a cheap video camera a free video editing platform and the benefits of YouTube’s vast army of viewers. Not bad for an afternoon’s work. 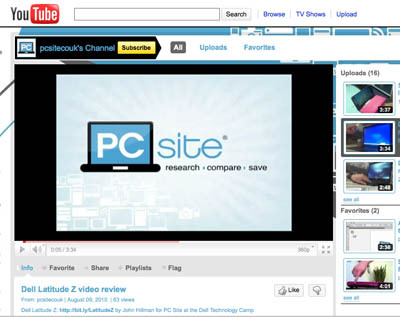 This entry was posted in Broadcasting, Online Journalism, Traffic and tagged Adobe, Camtasia Studio, Flip camera, John Hillman, PC Site, TuveMogul, Video, video editing, YouTube on August 23, 2010 by John Hillman. From today Google can now perform Optical Character Recognition (OCR) on any scanned documents that it finds stored in Adobe’s PDF format. OCR technology helps convert a picture (of a thousand words) into a thousand words and the words can now be searched and indexed. “A small but important step forward in our mission of making all the world’s information accessible and useful,” said Google on its blog. This entry was posted in Editors' pick and tagged Adobe, google, OCR, Optical Character Recognition, PDF, technology helps on October 31, 2008 by Judith Townend. The Keeley Hazell application (see below) was built using Adobe Air – a new piece of technology, which allows one widget to be built that will be compatible with both PC and MAC systems. Further editorial developments are planned for the site over the next few weeks to build on changes to the site navigation and page design introduced last week. The homepage is longer and features a panel on the right-hand side showcasing breaking news, ‘most read’ and ‘most discussed’ articles. In addition, users are now taken directly to the article after clicking on a homepage headline, rather than visiting the section homepage. 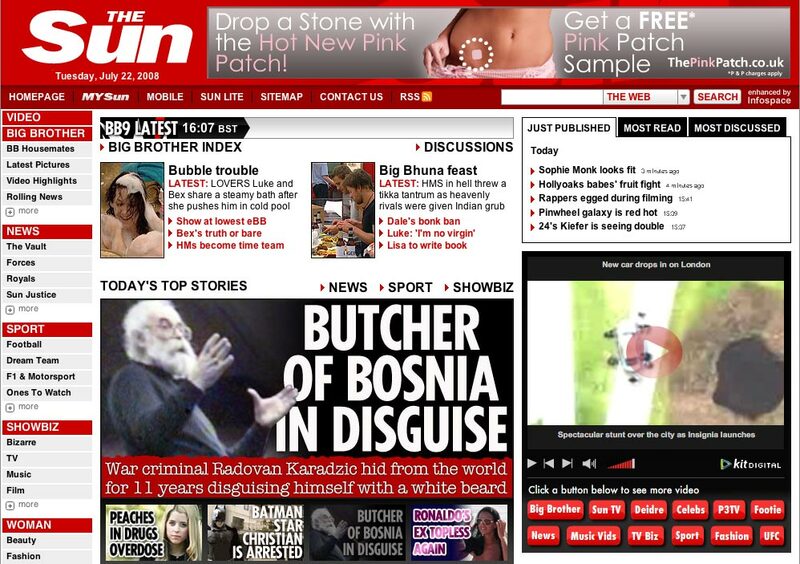 The changes to the homepage have received criticism from media commentator Roy Greenslade, who asked if the revamp was a reaction to the Daily Mail’s recent relaunch. However, Danny Rogers, The Sun’s editorial manager (online), said the new features were the result of long-running development. “It has nothing to do with the Daily Mail. This has been going on for the last six months,” he told Journalism.co.uk, adding that the changes were aimed at displaying content in a more accessible and user-friendly way. This entry was posted in Newspapers and tagged Adobe, Danny Rogers, editorial manager, Journalism.co.uk, launch, Media commentator, Roy Greenslade, The Daily Mail, The Sun, widgets on July 22, 2008 by Laura Oliver.